No matter what year it is or how old you are, if you love music, there is nothing like finding some new music tucked under the tree or crammed into your stocking. iTunes gift cards are easy. So are gift cards to Tiffany's, but we bet your girl would be a lot more receptive to the blue box. That's how music fans feel about music at Christmas. Despite the ability to download songs on a whim, we love the hard copies. Here at Rocks Off, we've all gotten music over the years, some better than others. We asked our writers to offer up their memories when it came to music from Christmases gone by. As we suspected, our peeps have some interesting stories. In 1978, my mother and I were at the mall and we stopped into the record store -- probably a Sam Goody. I was all of nine years old and my mom was being sneaky. She approached me and asked what a cousin of mine, who was a teenager, would like for Christmas. I said I didn't know, but she asked, "What record would you want?" I picked out a couple of records and, lo and behold, the cassettes ended up in my stocking. That is my earliest memory of receiving music for Christmas, but CDs remained my number one gift request while growing up. I always purchased albums of my favorite bands on the very day they came out (Smashing Pumpkins, mostly), but specifically remember receiving albums like Tripping Daisy's I Am an Elastic Firecracker, Radiohead's The Bends, Lush's Lovelife, and Sonic Youth's Washing Machine for Christmas, all around the same year or two (1995-1996). 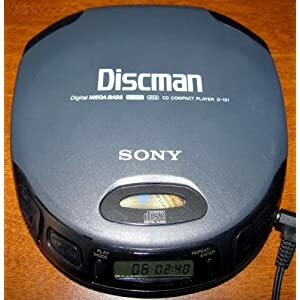 For Christmas in 1996, I got a new Sony Discman, this one, and a few compact disc from my mother. Blues Traveler's Live From The Fall, and Four. I was super into jammy stuff at the time, thanks to MTV, the Dave Matthews Band's Crash which came out that summer, and the fact that it wasn't as duh-duh stupid as the stuff that was geared towards 13-year olds at the time. Plus, Blues Traveler sounded like the dusty, worn vinyl my dad was bringing home to me from garage sales, but they were modern. I remember 1990 being a really tough year for me. My grandfather died; I started fifth grade, where I had a teacher who made it her mission to ruin me; and most terrifyingly my family moved to a new house. If it hadn't been for the copy of Faith No More's The Real Thing that I received for the Christmas of '89, I might not have made it. I remember marveling at how the tape had a blue label with the songs printed in white and since blue was my favorite color I thought it was so cool. I folded and unfolded the insert until its perforated creases began to give up and tear. I would ride in the backseat of my grandmother's Park Avenue, the racket of an alien world on my Walkman drowning out the grown-up chatter from the front of the car. My mother and grandmother would take me with them to Handy Dan to pick out things for the new house. I would wander off, collecting Formica samples, thinking I understood what it meant to be "somewhere in between". When I got home I would line the samples up; first according to size and then according to color and then according to texture. Then I would separate them into groups according to how well they complemented each other. "Droplets of 'yes' and 'no' in an ocean of maybe." I was happy that "Edge of the World" was at the end of the tape, I hated that song and I could just fast forward and start it all over again. It was so satisfying to feel my thumb click the play button into place.